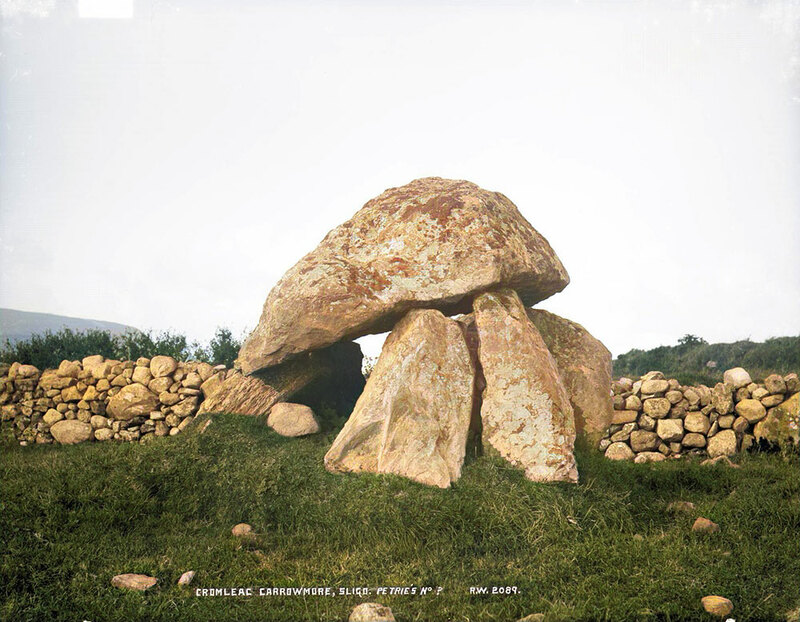 A watercolour of the impressive Dolmen 13 at Carrowmore painted by William Wakeman around 1878. Image © County Sligo Library. Site 13 is located right beside the Seafield road, just a few hundred meters north of the visitor centre. The circle of this monument was destroyed before any records were made, but we could guess it was about 13 meters in diameter. 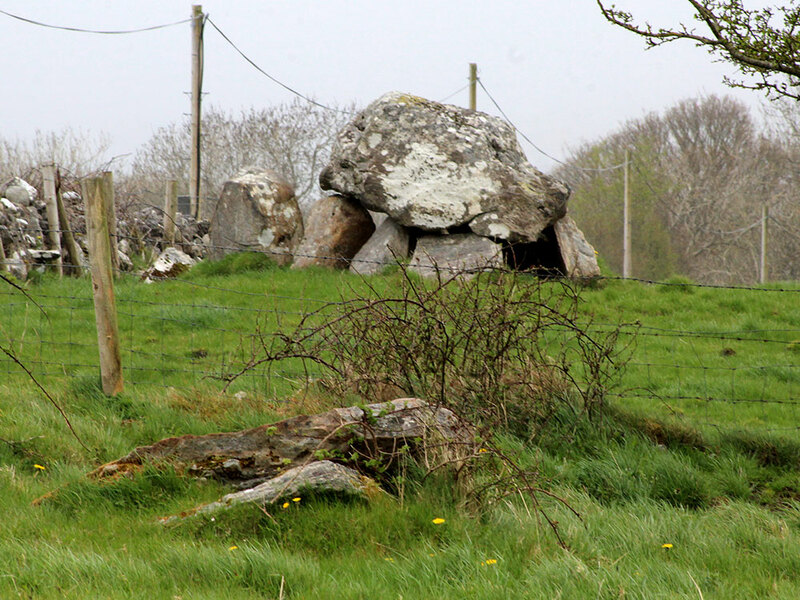 What remains is a large and impressive dolmen capped by a large split boulder. The stones are, as usual, all of gneiss. When Wood-Martin excavated the monument, he found it had already been cleared, most likely by Roger Walker. He found 600g cremated bone, fragments of shells, small pebbles, charcoal, and a piece of glass. This monument was hit in a car crash in 1985, and the capstone was badly displaced. It was later repaired by Swedish archaeologists using a crane, though it seems to have slumped down again. A postcard of Carrowmore 13 from around 1900. 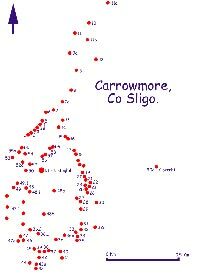 This site and Circle 7 are thought to mark the gateway or entry point into the Carrowmore complex, and as is often the case in Ireland, the modern road may well follow the route of the original road. There certainly was a lot of activity in this area during the Bronze and Iron ages. Like Circle 7, dolmen 13 is large enough for a person, and has a short passage pointing away from the centre of the complex. 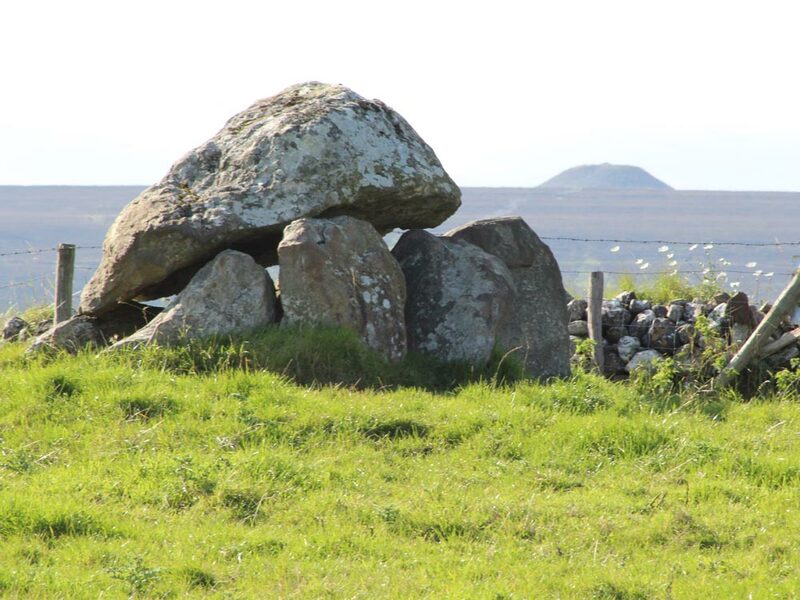 It is the first dolmen seen by the traveller on the road from Sligo to Carrowmore. '"This circle has been destroyed by the road passing through it, but the cromleac remains, and is a fine monument of its kind. The table-stone is 20 feet in circumference, and is supported by six stones; but on the west side, or head, there are four more stones, lengthening the grave, as frequently occurs in such monuments." - Petrie. Dolmen 13 at Carrowmore, a sketch etched from a drawing by Petrie, 1837. "On the north side" (Petrie's east side), "it has the peculiar porch-like entrance of 10, but it is difficult to decide whether it was a purposed lengthening of the grave..... or whether the monument had been originally a double cromleac. The cap-stone resembles in shape the head of a mushroom." The results of a search among the contents of the area under the covering-stone which had been thrown out and replaced perhaps, or overlooked during a previous search, "consisted of four hundred and twenty-eight small fragments of clay-coloured bones, and twenty pieces of charcoal. There was no appearance of the action of fire, and yet the bones must have been burned, though imperfectly, as some few fragments show the crack-like marks produced by fire, and noticed in other sepulchres. There were also fragments of shells, small pebbles, and much fine brown humus and sand. Of the uncovered portion of the monument two stones remain. Close to and under one of these was found, in situ, a 'pocket' of calcined bones and an amorphous fragment of greenish glass, coated with a thick, whitish crust." Petrie is said to have found "opaque blue-glass ornaments in cairns in the north of Ireland." - Wood-Martin. 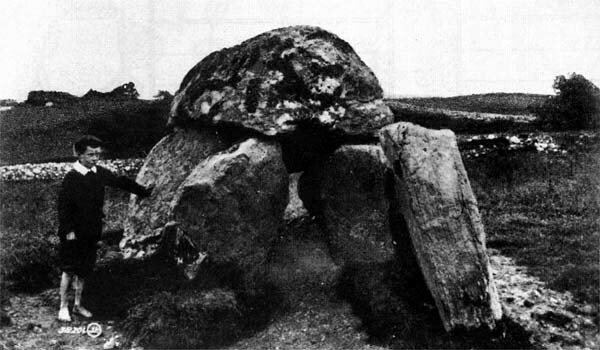 Dolmen 13 at Carrowmore photographed by R. Welsh around 1910. I found, together with urns, calcined remains, vitreous, barrel-like beds, etc., in an encircled cairn raised around a natural rock on the cliff at Boscregan in West Cornwall, a thick piece of dark-blue glass which had become iridescent, seemingly a portion of a globular bottle of no great size. The thickness of the glass in comparison with that of Roman glass of the ordinary lachrymatory type was remarkable.